Okay, y’all.. does anybody else completely loathe washing your face at nighttime as much as I do? Well, as much as I hate it I am a diligent, persistent, washing my face machine. If I go even one night without washing my makeup off (or just washing my face even when I haven’t worn makeup that day) my skin suffers the consequences. When it comes to facial care let me just tell you I have tried it all. The expensive, the inexpensive, the in-between.. you name it, and I have probably tried it. I have tried so many products, but only one specific face wash seems to work best for my skin type. You see, I have extremely sensitive skin. Even the slightest change in routine causes my face to breakout. I am completely in love with this Neutrogena: oil-free acne stress control. The strength of the ingredients seems to be just perfect for my skin type.. not too strong, and not too weak.. it’s perfect. Also, this product is an Allure Award Winner for best beauty products. Disclaimer: I do not know everyones skin type.. only you can be the judge of that. However, it’s worth a try if you haven’t ever used it. It makes the biggest difference in my skin. Be sure to buy the green with the beads. (I’ve tried the green without them and there is a big difference.) I’ve also tried the pink, and it was too strong for my face. However, to each his own. P.S. I have also found that washing my pillowcases weekly helps keep my skin from getting unwanted breakouts. So much dirt and grime can be in your pillowcases after just a few sleeps. Keeping them extra clean will keep all that unwanted nastiness from entering into your pores and causing a breakout. Just a little side note for you lovely people. I’ll tell you this Clean and Clear Persa-Gel does wonders for a girl. 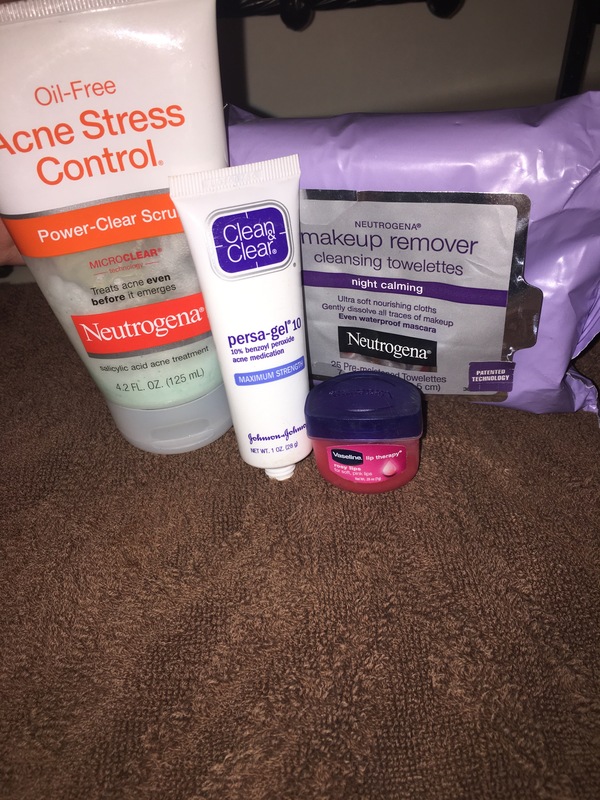 I have those annoying little breakouts every so often, and when that time comes this stuff is bomb for helping me get it “under control.” “Clean and Clear and Under Control” or something like that they say. It is true. If I have any annoying breakout, I simply apply this at night, leave it on throughout the night, and the breakout gradually becomes less noticeable over the course of a few days. You’ll love everything about this product! The Neutrogena Makeup Remover Cleansing Towelettes are probably my favorite of them all. This stuff is killer for removing all the excess makeup from my eyes and face after having washed what I could off with the above product. Go for the purple packaging. I love the way these smell versus the blue packaging. The blue don’t smell horrible.. I just prefer the purple. The smell really is night calming as written on the label. Finally, the lip therapy is a MUST! I’ve been using this for quite sometime and I absolutely adore it. I have such a hard time keeping my lips hydrated especially during the cold winter months. If you’re a lipstick lover like me keeping your lips smooth is absolutely essential for wearing those gorgeous lipsticks and stains that we all adore. Nobody likes a cracked/flaking lipstick, and this lip therapy by Vaseline is just the trick to fix that little problem. I wear mine at night that way I can wear my favorite lipsticks/stains during the day. However, this “rosy lips” could definitely be worn during the day for a little color and hydration. Especially if you’re not a lipstick kinda girl, and you prefer to keep it simple. The tint of pink looks lovely, and some days if my lips are feeling dry I will replace this in my routine instead of my favorite go-to lipstick.